Boosted by several new initiatives and special sections, the latest edition of Kingpins New York concluded its two-day run on a high note last week. The show, which features the best of denim manufacturers and suppliers and will celebrate its 15th anniversary next summer, was once again held at Basketball City on the Lower East Side and showcased about 70 exhibitors from across the globe. And inside the complex there was Kingpins Curiosity Shop, selling unique denim or indigo-inspired knick-knacks and other items from across the world, the Kingpins Creatives section featuring specialized industry insiders ready to share their advice and a display of photographer Eric Kvatek. 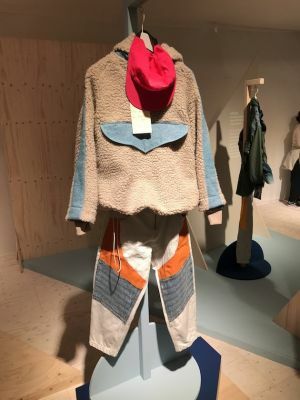 The Kingpins Creatives area also included trend forecasting by longtime denim insider Christine Rucci (aka Godmother) who used her onsite vintage pieces to predict that the years 1950, 1976 and 1984 will be the most influential in forthcoming denim design. Kara Nicholas of Cone Denim, one of the show’s top-notch exhibitors, agreed. “More and more people are asking about it [sustainability],” she said.